The 2004 WSOP champion Greg "Fossilman" Raymer led an all-star cyber cast in the new Poker Stars Quarterly $1,050 NLHE last Sunday (March 26th). The Poker Stars ambassador and all round nice guy put in a thoroughly thrilling performance to reach the final table with a huge stack of chips but he was eventually defeated heads-up by "E-Daddie" from Houston, Texas who took home a magnificent $295,000. Poker Stars have for many years now ran a hugely attended Sunday evening event (commencing at 9:30pm UK Time). The guaranteed prize pool has soared along with the numbers of entries and recently the site has also increased its guaranteed prize pool to a whopping $1M. There was a change to this week's tournament though as the entry fee was increased from the standard $215 to $1050, this meant fewer entries than normal but an even bigger prize pool. Most people gain their entry into the Poker Stars flagship event through the plethora of satellites the site run throughout the days and hours leading up to the event, which gives this big buy-in tournament a real unique feel as people can have gained entry into it for as little as $3. Amongst Raymer and the other 1500 hopefuls battling it out for the $1,523,000 prize pool were the current WSOP champion Joe Hachem, top European players; Noah Boaken who plays as 'Exclusive', Bengt 'pkrbt' Sonnert and top American's Dustin 'neverwin' Wolf and Scott 'emptyseat88' Fischman. This was a truly class field for a truly great event. 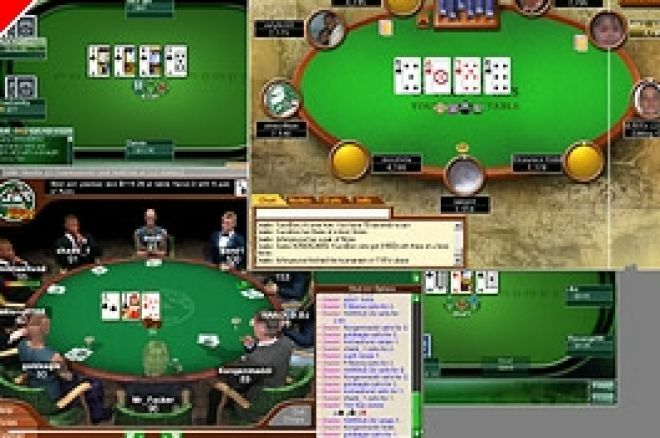 Poker Stars decided to change the structure of the tournament slightly too by lengthening the clock so the blinds only increased every 20 minutes as apposed to the normal 15 minutes, this really did allow for greater levels of play and more time for the better players to try and outclass their opponents. The tournament lasted for a lengthy 10.5 hours with it eventually coming down to a heads up battle between Greg "FossilMan" Raymer and E-Daddie. Despite the huge sums of money on offer and the gaps in prize money between the places there was no deal made and the tournament was played to a finish. Raymer had much of the chip lead throughout the duration of the heads up battle but E-Daddie eventually battled back to edge in front. Such was the structure of the competition and the amount of chips in play it wasn't your usual crap shoot heads up battle. Both players had well over 30 big blinds at most times with the chip average being over 40 big blinds which is testament to the design of the tournament structure. The final key show-down was on the back of a hand that saw Raymer lose the chip lead. With the blinds at 20K-40K, the FossilMan raised it to 160K and E-Daddie re-raised to 400K perhaps testing the water or sensing a move from his opponent. This prompted Raymer to push all-in for his remaining 1.5 million in chips. E-Daddie called instantly with his JJ and Raymer flipped his desperate looking 10-8, which was drawing dead by the river. He will be so so disappointed with second as I am sure he not only would have loved to have added the $295,000 to his already sizeable bank roll but he would have loved to have got the victory on home e-soil for his employers. I am sure the $183,000 second prize will come in handy though! Congratulations to E-Daddie on defeating one of pokers true greats and true gents. - His reward - a cool $295,000. The big Sunday $1M competition is back again this weekend on Poker Stars, however the entry fee is back to the normal $215 and a field of around 5500 will battle it out to see who can be the next big winner. Ed note: Take on Fossilman at Poker Stars the home of the world champions. Everest Poker Launch European Poker Championships.